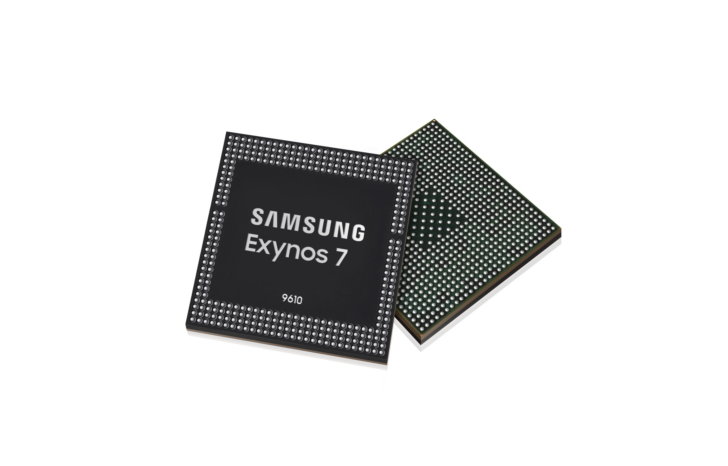 Samsung Electronics announced a new application processor (AP), the Exynos 7 9610. Manufactured on Samsung's 10nm FinFET process, it offers premium features to mid-tier smartphones, boasting deep learning-based image processing and slow-motion video capture capabilities. Comprised of four Cortex-A73 cores clocked at 2.3GHz and four Cortex-A53s at 1.6GHz, plus a Mali-G72 GPU, multimedia is the focus with the Exynos 7 9610. The highlight here is the neural network engine powering the improved image and vision processing. This deep learning will enable better face detection, even if the face in question is obscured by something like hair or a hat. It also enables "smart depth-sensing single-camera out-focusing" (portrait mode) and "augmented low-light images" via multi-frame merging and an enhanced signal-to-noise ratio. With the improved image signal processor (1.6 times faster than its predecessor) and twice-as-fast mobile industry processor interface (MIPI), the Exynos 7 9610 will also support 480 frames-per-second slow-motion video capture in 1080p, even if a traditional two-stack image processor is used. And thanks to its use of a multi-format codec, it can encode video up to 4K 120fps. The AP also includes an embedded Cortex-M4F-based low-power sensor hub, which manages the host device's sensors without the need to wake the main processor unit. The onboard modem supports Cat.12 three carrier aggregation with download speeds of up to 600mb/s and Cat.13 3CA at 150mb/s for upload. Other connectivity options include 802.11ac 2x2 MIMO WiFi, Bluetooth 5.0, an FM tuner, and a four-mode GNSS (GPS, etc) receiver. Samsung says that the Exynos 7 9610 will hit production in the latter half of this year, so we'll likely see phones with it start popping up in early 2019.